Mini Roulette is nothing else but the true alter-idem of the regular European single 0 version. Just how many similarities there are, you will find out in a short while. Till then, let's have a look on some differences: instead of 36 pockets + the 0 pocket, Mini Roulette features 12 slots + the 0 pocket. We reckon there is no need to underline that the Mini Roulette fell shorter of 24 slots in relation to the regular Roulette wheel. This latter observation can misguide some of you, but let us jot down a highly relevant aspect first: the smaller the wheel the bigger the payouts! You see, small isn't always that bad! on black and/or red numbers, etc. 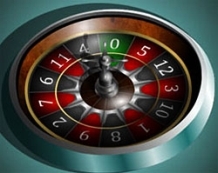 We reckon that 9 out of 10 people are already accustomed to spinning the wheel and placing the wager. For that reduced percent (10%), who have absolutely no idea how this is done, we have created a short presentation. In order to start the game, the player is to choose a chip and place it on a certain place on the table. The area where the chip is to arrive is solely up to the player. Depending on the player, the bet can consist of one or more chips. Online Mini Roulette makes all this even simpler: clicking on the chip and dragging it to a desired place on the table is all one needs to do. Regardless the game (internet roulette or land based), the player can place several chips on different betting areas simultaneously. Right clicking on a certain area with chips will make your chip disappear, this is a useful move for those who changed their minds and want to alter/remove their bets. At this stage, there is nothing else to do but spinning the wheel. Nothing compares to the payouts of Mini Roulette! Even/Odd bets, Red/Black bets, 1-6, 4-9, 7-12 trigger 1:1 payouts, while straight bets trigger 11:1 payouts. Those who would like to spend some quality time with friends, without having to worry for the financial implications of the game had better get on board this user friendly game, as this small game has a lot to offer! Enjoy!